We’ve gone fishing so to speak which is why we’re late posting. One reason is the primo catnip which arrived from our friends Picardo and Coco. @picardotheprayingmantis advocates for feral and community cats in Indiana and Palm Beach Island. Oh, boy, it inspired some wild photos and art. 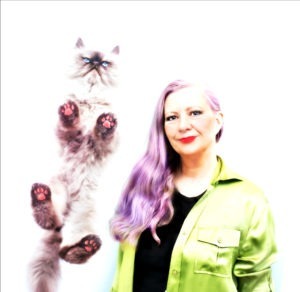 All their catnip is donated to rescue organizations and benefits the feral cats of Palm Beach Island. And, oops we almost forgot…it’s Take Your Cat To The Vet Day. 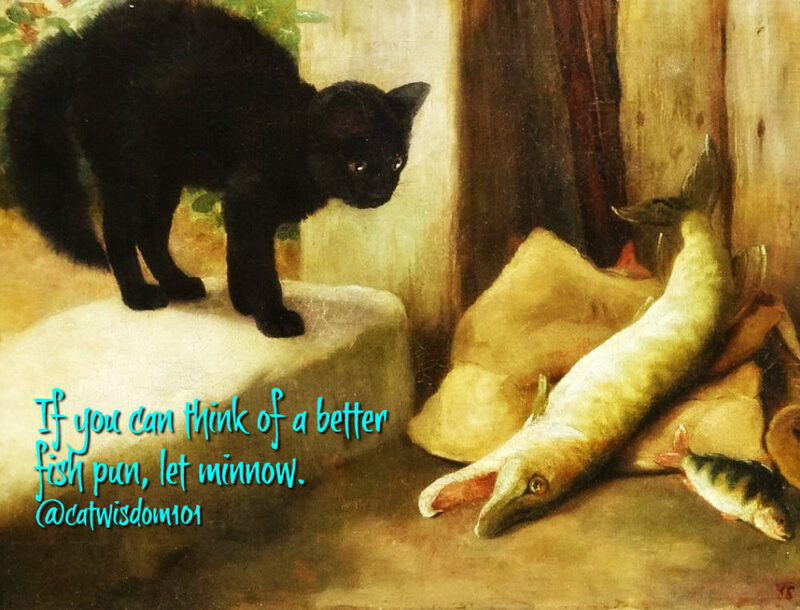 Click to see our post on tips plus our all time favorite quote about success from Angel Merlin. We were lucky to get a large stash last year since it’s not available for sale. It’s without exaggeration the most potent ‘nip on the planet. This week a package arrived and we didn’t need to read the label to know the contents. A mind-bending scent of catnip filled the room, through two sealed plastic packages. To prove it, I let Odin sniff it and he was high without touching green goodness. Coco says her new bee hives are the reason the harvest is extra strong this year. More bees =more pollination=more flowers=more joy! The next two buyers of our book will receive a free gift bag of the catnip. For real! 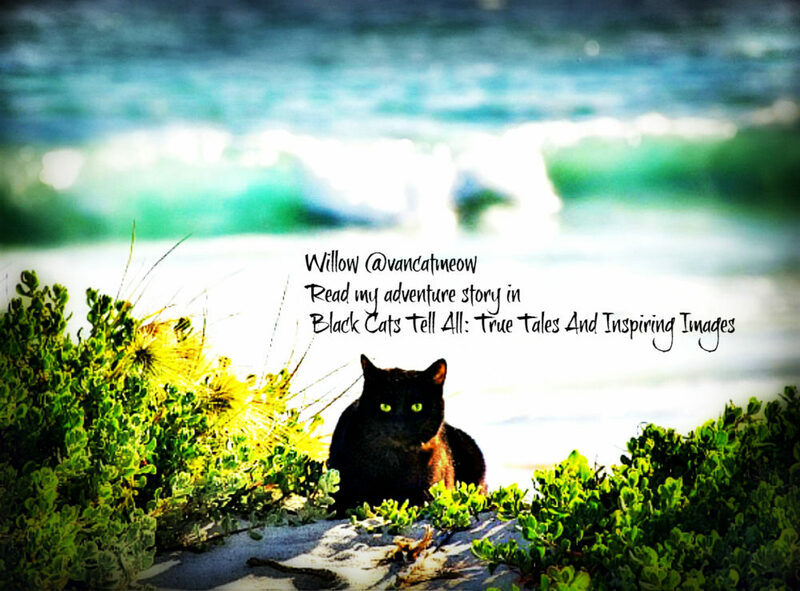 Buy Black Cats Tell All: True Tales And Inspiring Images directly from us. Our readers are a creative bunch. Last week we got this review on Amazon and thought what a great idea. We’d love to hear new ways to get the word out about our book cause. Leave a comment or email us. I love my Black Cats Tell All Book. I keep my book in my car and take it into appointments with me. I usually can polish off one to two tales depending on how long I am waiting and the time flies by and I am in a good mood! Other “WAITERS” see the cover and ask me about it. They think it is a perfect idea. The catnip calmed everyone down and inspired some footloose and fancy free fantasies. 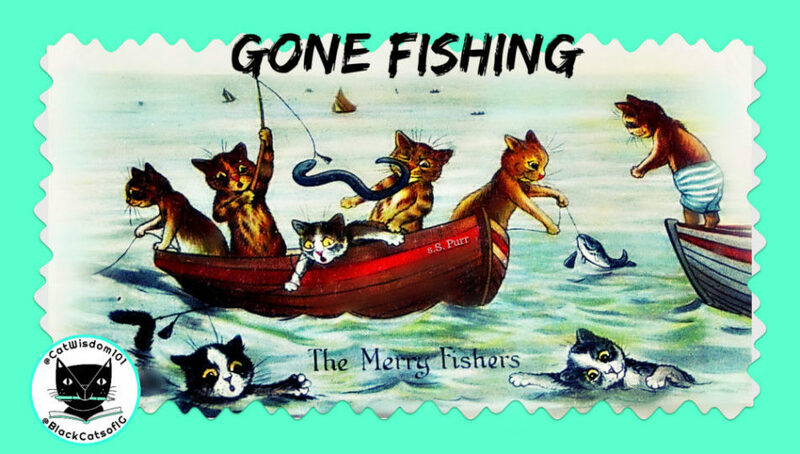 Not to mention some irresistible vintage art on a “Gone Fishing” Meme theme. Domino is ready for the beach. 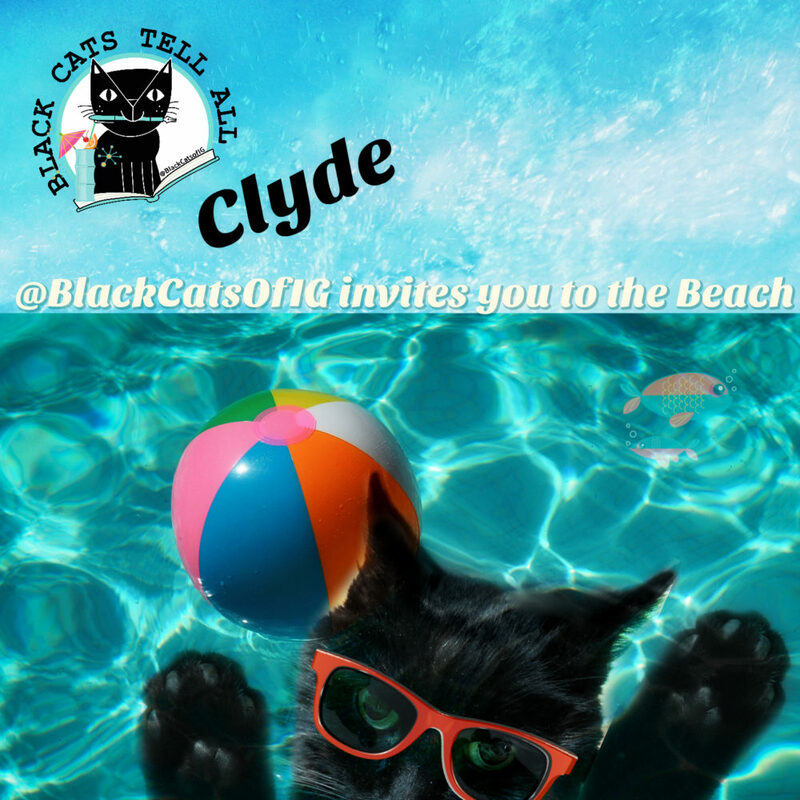 Clyde has visions of beach pool volleyball inspired by a long-lost relative. Hmmm, it could be a fishy story. 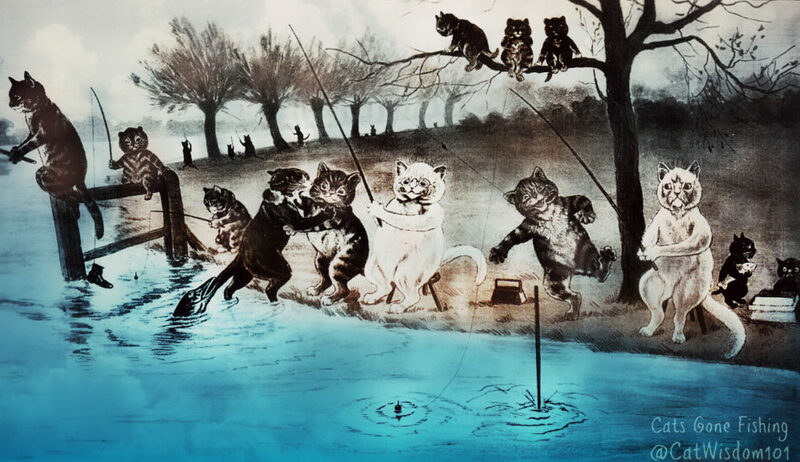 Oddest Victorian black cat art ever? Doesn’t that fish look like the one in this illustration? Enough fishy business and more beach with this classic Kliban. This is begging for a caption. Leave your silliest comment and you might win something wild. 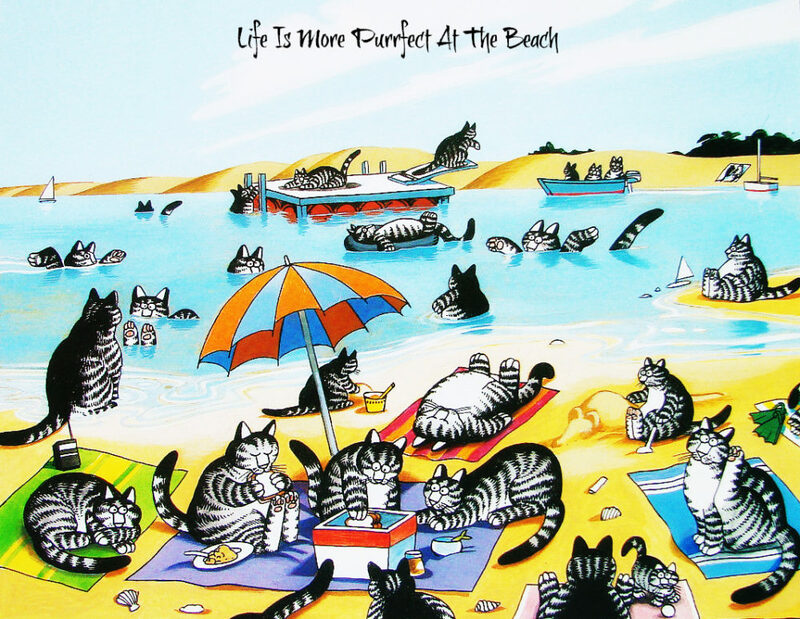 Some cats have adventures at the beach for real like Willow @vancatmeow This is an out take from our book and her true tale from Australia is truly inspiring. And we have gone fishing. Really. See you soon. Layla, Clyde, Domino, Odin and Nou Nou. Whoa! Im not a niphead but this sounds special. I dunno. I’m sure the adult cat with the camera is saying “hold still so I can get some vacation pictures.” The little one is saying “look! 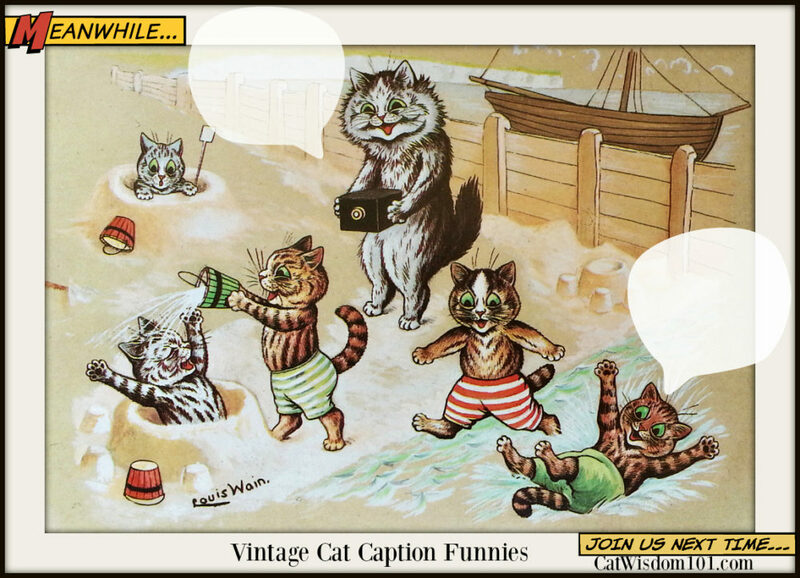 I’m rolling in catnipy sand.” Either way I hope you catch some fish cos I’m in. Thank you for blogging about my organic catnip! It is so healthy for cats – like a probiotic. When ingested, it is also a mild sedative, and when sniffed, it winds cats up and then gets them sleepy. Cats know instinctively what they need- to ingest or sniff. Some people put catnip into a bit of wet catfood at night just before bedtime to help get them to sleep. I could go on and on about the benefits of catnip. It’s so easy to grow. Some seeds in a pot. Water. Talk to plant. Hanging baskets are best because it is safer and has a chance to grow. I’ve had cats literally pull the roots up the roots and eat them. Thank you so much for the extra ‘nip tips! I love those fishing pictures! 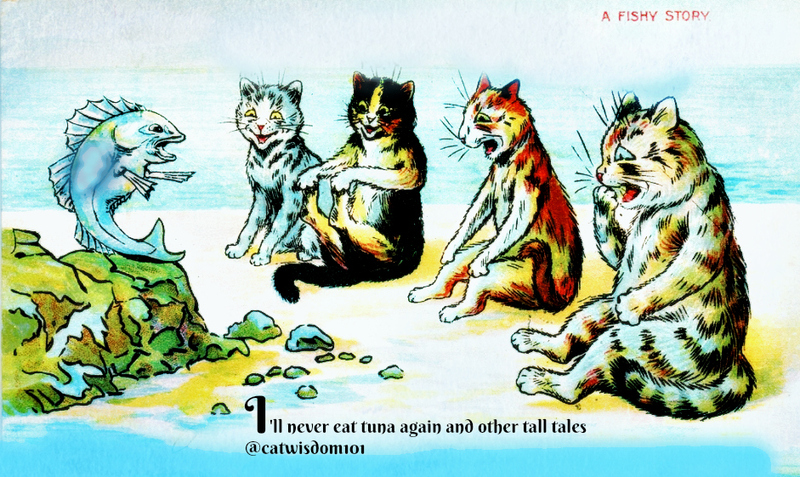 The tuna one and the one above the Kliban are my favourites. Thanks for stopping by. Those are my favorites too! And that nip must be more potent thn you can know, cause as soon as I started readuing your post, Pipo came up to lounge on the chair beside me, then he got all crazy and mrouwed at me to tickle his belly…and then he pawed me and now he’s having a bath. He almost nevfur comes there at night! OMC!! Wow, that nip sounds like really potent stuff! It is. I wish we had smell-o-vision so you could smell it .